In Poupendol statistics , it often happens that the search word "Loulotte" appears. We therefore had to satisfy our visitors, especially as this adorable little doll of our time is delightful in every way ! In fact, Mr. Maurice Languereau, author of "Becassine" under the pseudonym, an anagram of Caumery, had a daughter, Claude, whose existence had inspired the creation of character "Loulotte ". Miss Languereau become Madame Jacques CANLORBE recently died in PARIS about two year ago. 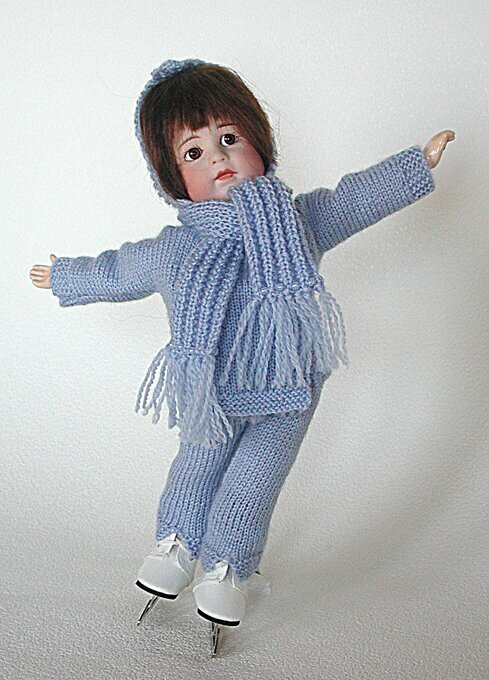 Early 1993, Mrs. MERLEN had the idea of a souvenir doll for this "World Congress Bleuette". 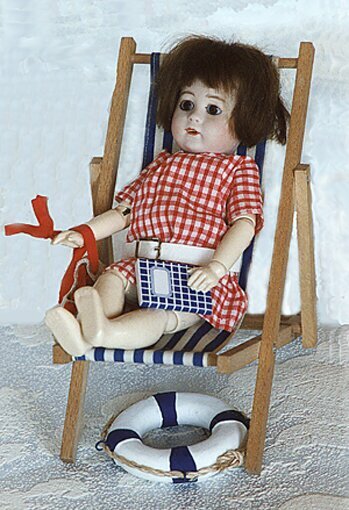 Courtesy of Mrs. CANLORBE, daughter of Maurice Languereau, aka Caumery, author of the texts of the famous cartoon Becassine, this doll was named "Loulotte ". to Bernard TERRIE (Het Gents Poppenatelier Brusselsesteerweg 240/242 9090 Melle, near Ghent). Three different molds were presented to Mrs. CANLORBE choice. An initial print run of 2,000 dolls, all numbered, had been arrested. The clothes were (and are) made by drawing the wardrobe in the Loulotte albums Becassine (A note that, in turn, PINCHON, illustrator and Becassine Loulotte, inspired too often the wardrobe Loulotte-Claude Languereau ! ). They were made in materials and noble classics (skirts and berets in pure wool, cotton and linen wimple, hand knitted socks in pure cotton ...) by Marie-Edith CHARLES and two persons employed for this purpose. 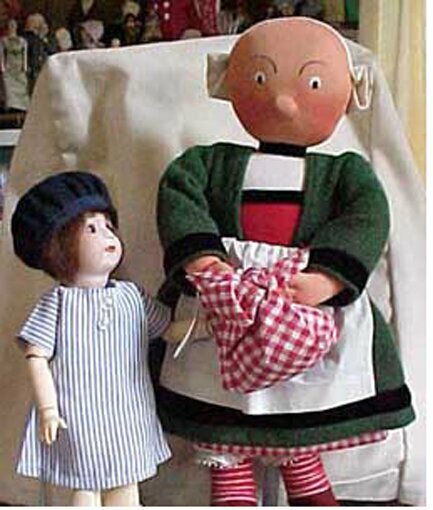 Publishing GAUTIER and GAUTIER-Languereau, broadcast from 1905 to 1960 "La Semaine de Suzette", which featured the doll was the very famous "BLEUETTE ". This newspaper was also the chronicler of the adventures and misadventures of Anais Laborne, known as "Becassine" because of native-born of " Clocher les Becasses " near Quimper, in addition faithful servant of Madame la Marquise de GRAND'AIR. She became nurse Loulotte ! 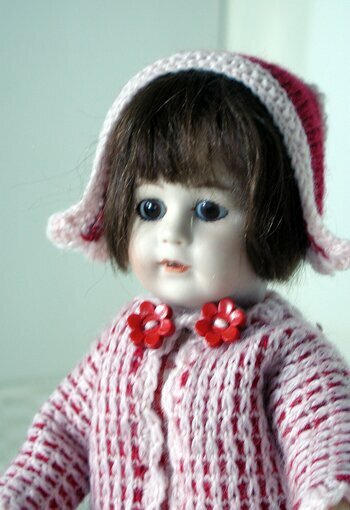 Despite the postponement of the Bleuette Congress , Loulotte doll was marketed, sold primarily by subscription (500 F.), and direct sales end 93 and top 94, in various manifestations " Doll " (Fair GHENT, where she was presented for the first time September 26, 1993, Betton, Toymania, etc ....) and the "Bon Marché" Association "Circle Bleuette. 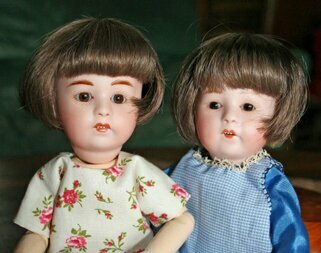 The sale of "Loulotte" was provided by Mrs. Charles could see that we stand in the main lounges dolls. The dolls were purchased delivered in a nice cardboard box light gray with a blue label, rectangular with cut corners, wearing a white background " Loulotte ", the number and the name of the garment, for example, "Loulotte No. 41 pensionnat ( pensioner)". Features Bisque head, according to the original mold TERRIE B. (perhaps inspired by a Simon Halbig mold), hollow or unmarked terrain, but the ink on the number of dolls, preceded by a "L" in cursive. Brown eyes fixed. Auburn mohair wig and leather shoes iof the house BRAVOT (BRAVOT Georgette, 13, Rue de Brunoy Villecresnes 94440). Painted eyelashes. 6 small mouth open upper teeth. Non-pierced ears. Height = 24 cm. Very difficult to rise elastic, very poor quality, are placed in a very complex. The Brand "Loulotte" was filed in BOULOGNE on Wed, September 24, 1993 and recorded November 19, No. 93485984, by Colette MERLEN-VANDUYCK (49 Rue Roger Salengro 59120 Loos-les-Lille) and Marie-Edith CHARLES MYLIUS (Castle College MACQUINGHEN Baincthun 62360). Protected classes: 20 (... Products not included in other classes of wood, cork, ... substitutes for these materials or plastics ....), 25 (Clothing, footwear, headgear), 28 (Games toys, ....). For several months (or years?) The two thousand "Loulotte" originally planned have been sold. Mussels that remains, it seems, were sold to Marie-Edith Charles, which was re-assigned to Mr. 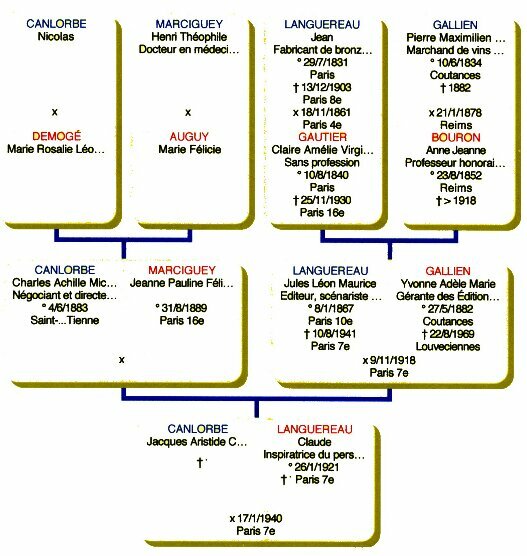 Default in the Lyon region working to make reproductions, beautiful course but are not actually used by real Loulotte "Loulotte" itself, namely Madame Jacques Canlorbe which you find below the pedigree provided by one of our friends.